Over the past several weeks, I've been wanting to take a long term Trek that encompassed a few planned destinations as well as some scouting. Either the weather, or my time prevented me from being able make that happen until this weekend. I managed to get a laundry list of things done prior to the actual weekend with the intentions of going out with the camera for a full day. I wanted to make that day Saturday, but there were absolutely no clouds in the forecast anywhere in the state (at least where I wanted to go). This meant harsh lighting, and limited shooting time at the beginning and end of the day. Sunday was looking more promising though with 75% cloud cover for the entire day, with the possibility of a storm. This was what I was looking for. 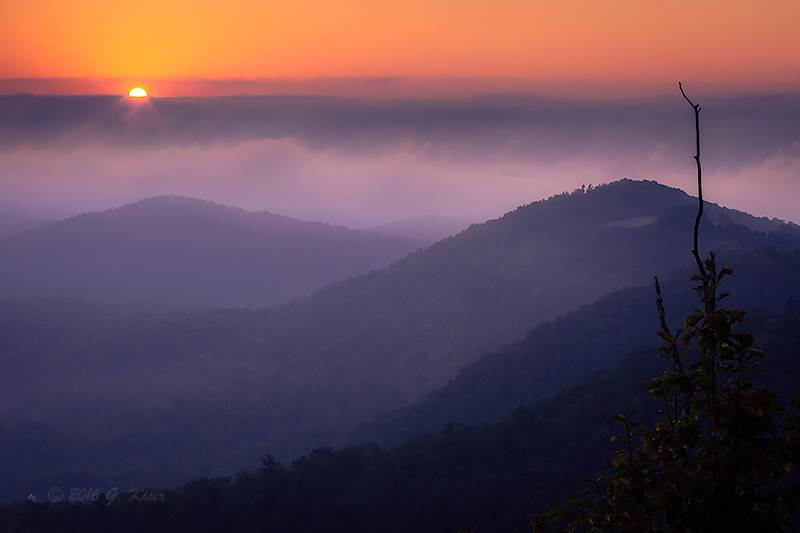 With the clouds coming in around sunrise near Roaring Gap, I chose to concentrate on that section of the Blue Ridge Parkway. 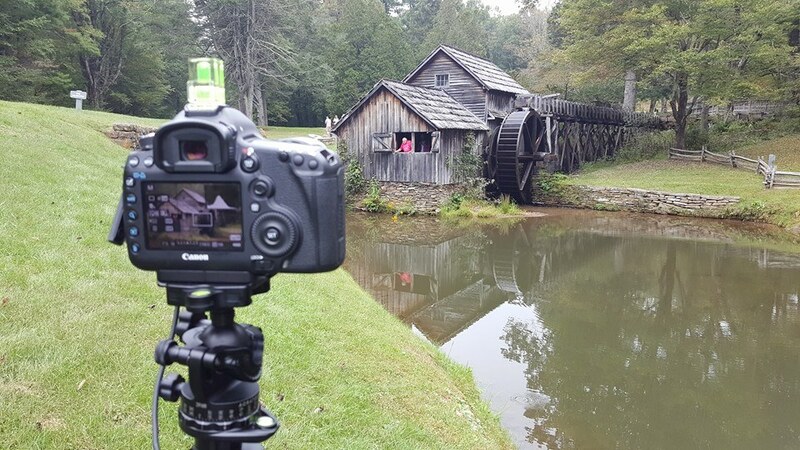 I would work my way North into Virginia to scout other locations as I haven't spent that much time on that section. I wanted to pick out a place that would have a good possibility of a sunrise photo. 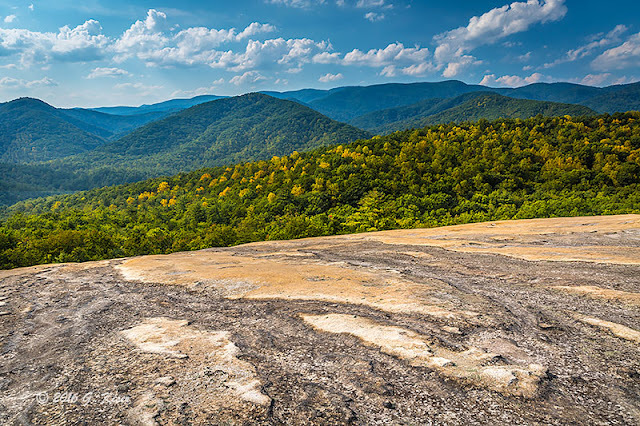 Looking back on what has worked before, I chose to go to overlook at Jumping Off Rocks at MP 260. It is a short hike through the woods in the dark, but the trail is well maintained and I have a great flashlight. I got up early, and checked the forecast once again. It was showing the same thing that I had seen going to bed. It was on...I got up and got ready to roll out the door at around 4:15 am. Getting up that early allowed me to arrive at my destination right before 6am. This gave me plenty of time to hike out to the overlook, and get things set up. Things were going very smoothly...until I arrived and looked up. Stars...Lots of stars in the sky. Not a cloud in sight! The problem with no clouds is there is very little to reflect the colors of the rising sun. This puts a damper on photographing sunrises since the primary draw in the color in the sky. Well, I've learned over the years that when the clouds fail, pull out the long lens that will allow you to grab a very small portion of the horizon. That small strip will have color due to the haze in the atmosphere, but there isn't much of it. I added a reverse ND filter to control the exposure and set up my first shot in near pitch black. With over five minutes worth of exposure, I wasn't happy at all with the outcome. There was just not enough interest in the sky. 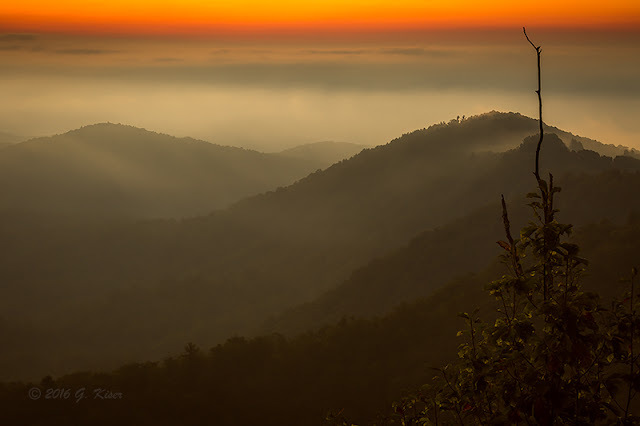 It wasn't until the sun started to come up, that the haze started to light up. I was finally able to work with that. It got even better when the sun crested the horizon, but only for a brief minute before the sun got too bright. Sunrises at this time of year still go very fast, and the sun climbs in the sky much quicker than it does in the middle of winter. After about an hour of waiting, I had about 10 minutes of action before packing up and going back to the truck. I kept looking at the sky on the way back and saw that the clouds were NOW starting to enter into the sky. At least I would have some drama in my skies for the rest of the day. As you can see to the left, the sky was pretty much washed out. In fact, for about an hour before I found this location, I was stuck in low clouds and fog. I could barely see to drive, much less be able to find anything to photograph. Knowing the weather patterns up here, I knew that eventually this would clear. I just hoped that it didn't completely clear and leave me with a blank blue sky. At least with the overcast conditions, I could have my choice of subjects regardless of what direction they had to be shot in. That is the nice thing about diffused lighting. The tradeoff is, with this kind of overcast, I can't include the sky at all. Fortunately, I was in the mountains, and there was plenty of opportunity to find subjects with a backdrop of trees or a hill. 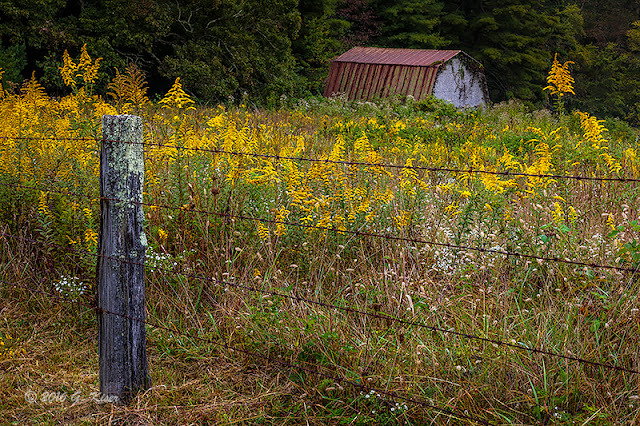 I happened on a barn tucked in below a field of goldenrods which I had photographed years ago. Ironically, I had first seen this barn on a stormy day, and had tried to include the sky for that shot. It worked, but not well. Today's view was much more promising with the golden field in front of it. I also knew better about how to deal with the sky. It was a job for my long lens once again, so that I could compress the background and keep from including the sky. With the narrow field of view, I was able to scale the barn much better with the fence post so that it wouldn't get lost in the background. Even though I didn't get the lower half of the barn, I think that it is the roof that holds the interest, and since the big story with this image is the yellow flowers, I was quite happy with the composition as a whole. The trick was waiting for the breeze to die down a little so that I could keep from blurring the flowers. I have to admit...I bumped up the ISO to 400 to get the shutter speed fast enough to render everything sharp. After shooting this barn, I was starting to feel the rustic subjects over the landscapes. That was probably due to the fact that there was no visibility into the distant mountains anymore. The lighting was right for barns and old houses today. There were a bunch of them along this section of the Parkway, but only a handful were situated in such a way that I could photograph them sucessfully. 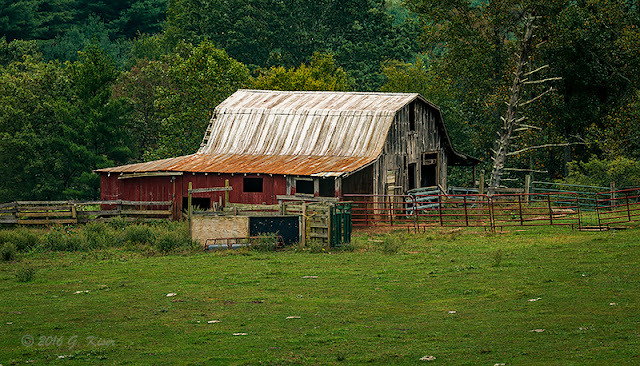 One such barn I found on a road that ran parallel to the Parkway. I found a way to get around to it, but sadly, I didn't like the point of view that it offered. 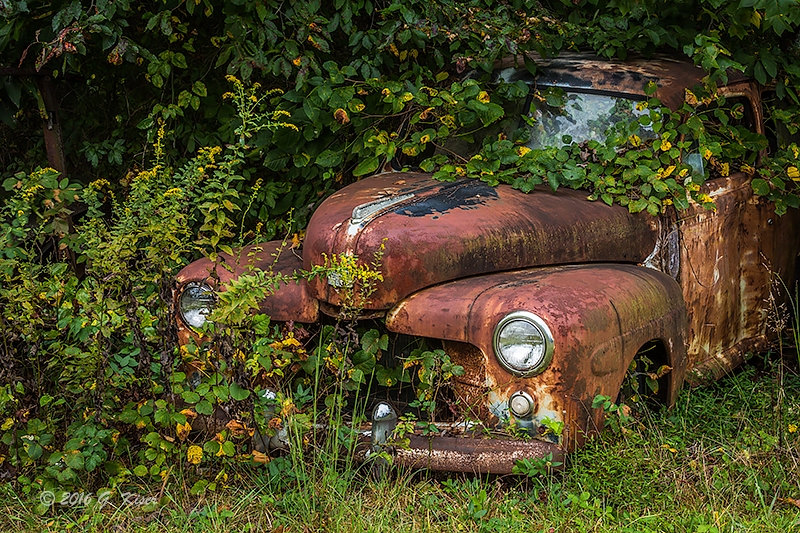 I ended up back on the Parkway, shooting through the vegetation with my long lens once again. This gave me the elevation that I needed to keep the trees covering up the background. This was a much harder barn to capture than it looks like. There just wasn't much I could add in with it for a composition. I finally decided to just rack the lens out and shoot it at 200mm, making it a postcard shot with the strange tree to the right of it to counter the main subject. Overall, I think that it turned out pretty well, but I was hoping for more with this one. Before I put my camera up, I happened to see an odd tree on the other side of the road. It was totally bare, and the bark was bleached. it stood out because it was surrounded by green foliage and yellow goldenrods. It was special enough to justify a quick composition or two. I kept my long lens on, so that I could compress the background, and concentrate on the tree as being the total composition. This is not usually my kind of photo, but I knew that if Toni knew I had passed it by, she would not be happy with me. So, I listened to the voice in my head that sounded like her and I created the image that I thought that she would like. I guess it worked because when I sent her the teaser picture while she was at work, she told me that she loved it.. So, here you go Toni...this one's for you! You see, sometimes I just go with my gut and it pays off. 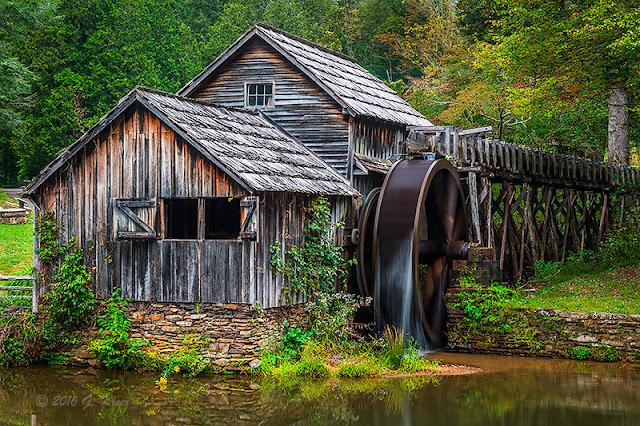 Years ago, I got a picture that I was very happy with with the exception that the water wheel wasn't spinning. I remember that it started up the minute that I packed the camera up. I missed out. This time, however, the wheel was spinning sporadically. 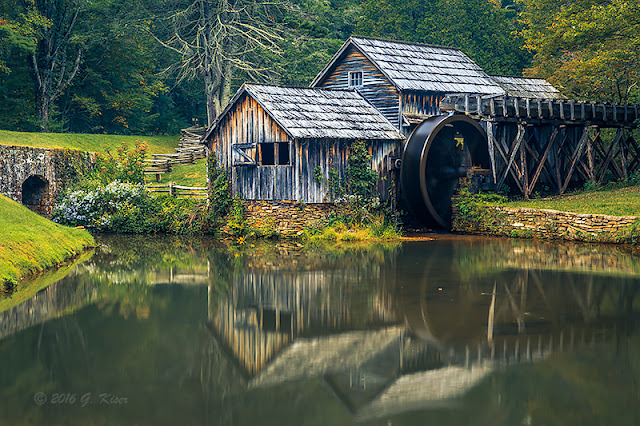 The challenge became timing the shot so that there were no people milling about in the frame, no people in the windows, AND having the wheel spinning. Talk about waiting for the planets to align just right. I did have the fortune of getting that lucky timing a few times while I was out there. This first picture actually happened pretty easy since the line of people waiting to go inside was covered by the mill from this angle. it was the next one that caused me to pull my hair out! I must have waited for 20 minutes before all the planets lined up and I had a workable shot with no people in it, plus the wheel spinning. I was very fortunate that this shot happened to be timed right when the wheel started spinning and dumped the accumulated water. The one second shutter speed blurred the water just right. I was very lucky to have timed this perfectly...even if by accident or coincidence. After getting this lucky shot, I decided I had had enough of the crowds and decided to move on down the road to see what else awaited me. I made my way about another mile on the Parkway and decided to get turned around. The weather was not improving, and I was just getting further and further away from home. My plan was to take a different way back in the hopes of finding something else to photograph. Well, that paid off in a big way! 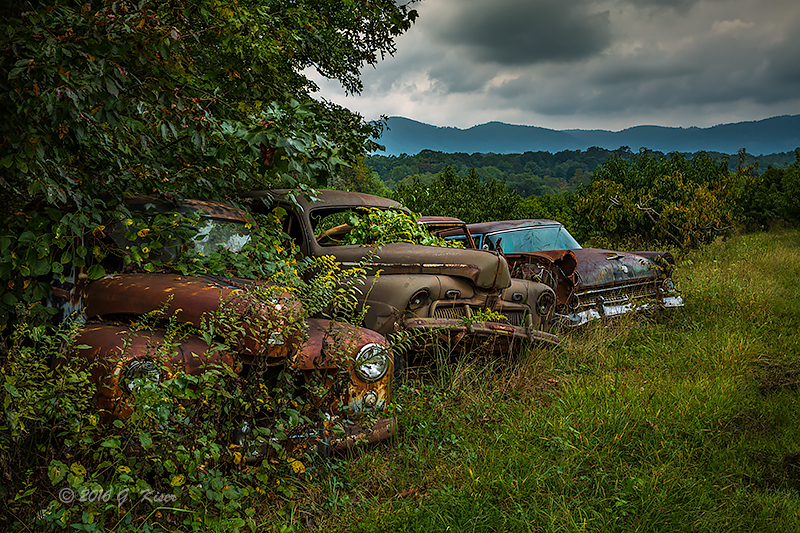 Not too long after getting on Highway 52 in Virginia, I came up on group of old antique markets. Beside one of them was a handful of old rusty cars. Hmmm, could they belong to the antique market? Well, I went to ask about them and was told that the owner of the market did own the cars. I was hesitant to ask about photographing them, but after a quick second of thinking about it, I was given permission to go and have my way with the cars. It has been a very long time since I've found some old iron to photograph and I was loving every click of the shutter. These cars were not easiest to photograph since they were right on top of each other. It took me a little while to figure out how to best capture them. I started with my long lens and found that I didn't like the perspective at all. I swapped out with my 24-70mm lens and found that I could get in close and use the wide angle without too much sharing of space with the neighboring cars. I took group photos, and individual ones. These cars had character dripping from their rusty bodies, and I was in heaven photographing them! I wasn't sure the models I was photographing, but was very pleased that they were ones that I had not previously shot before. That helps to make them special in their own right. With the way the brush had grown over them, I am pretty sure that this was the best time to photograph them. With the fall leaves, there would have been too much color, making them hard to stand out. Had I waited till winter, the overall brown tones would have blended in with the cars, again making them harder to single out. Yeah, I was happy with my luck in finding these when I did. 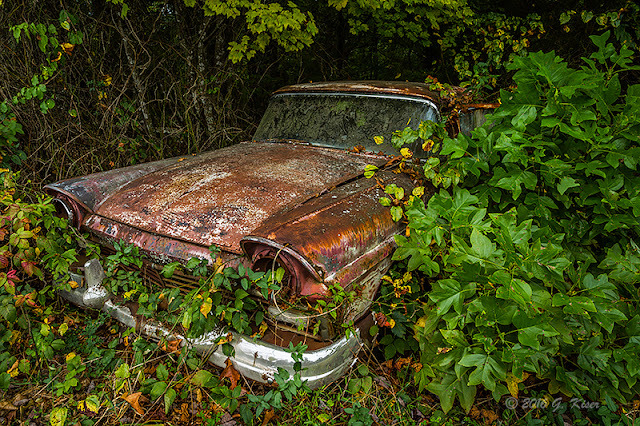 This property wasn't all rusty cars either. 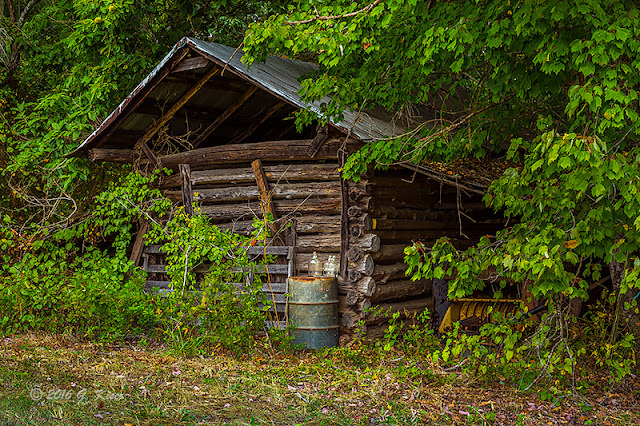 Just around the corner was an old barn tucked into the woods. Of interesting note, there were a few empty bottles on a drum out front. Of course, I figured that this had been filled with mountain whiskey at some point and I thought it added a lot of character to the barn. I grabbed a couple of quick frames before going back to work the cars some more. I had been concentrating on excluding the sky for most of the time I had been shooting so far. However, I was looking up and I could see some detail in the clouds starting to form. It wasn't much, but with a little help from graduated filters, I should be able to bring that detail out in the photograph. I decided to incorporate the sky a little bit and capture the cars from the opposite angle. The first one that I took turned out to be probably my favorite shot from the day. I was able to get the four cars all lined up underneath what turned out to be a wonderful sky. The lighting worked out perfect for the photograph as well. There was something brooding about this picture that just fit the long forgotten relics. This one worked out so well that I decided to go over to the other group of cars closer to the market and try another one in that same direction. 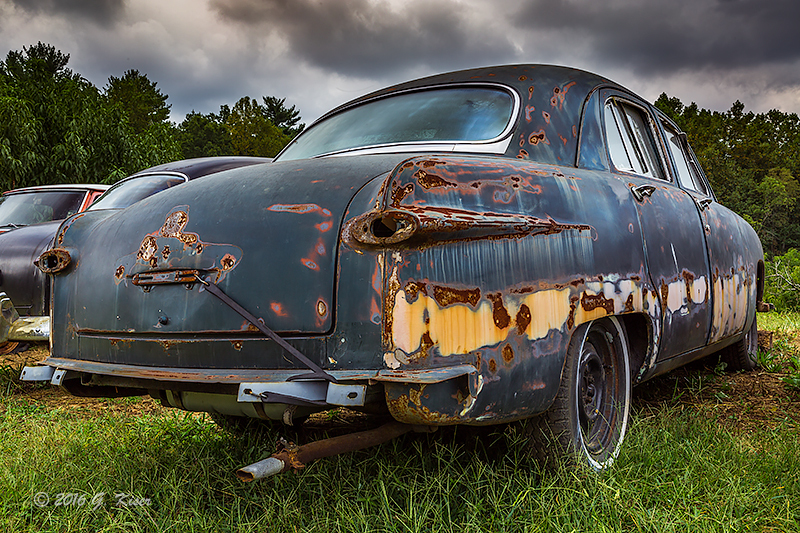 I'm not exactly sure what kind of car this is, but I just loved the patina of the paint. The rubber strap holding the trunk closed was a bonus as well! I was limited with the possible compositions, but I think that this worked out pretty well. You can sure tell the weathering that has taken place, and the foreboding sky helps to set the mood for this one. This was my last picture of the day. It was getting late, and I was needing to get home. It was a successful day for sure. It has been a long time since I've shot over 100 frames in a day. To have that work out to 13 keepers is amazing! I'm still perfecting my new workflow, but I think that I have something that will work out very nicely for sure! I've been wanting to get out and do some landscape photographs for a while now. Not the intimate ones that I've been doing, but some grand views of the mountains. I've been watching the weather for a while and haven't seen much in the way of favorable weather conditions here of late in the mountains. For the times that I could go, the skies were forecast to be basically clear. This doesn't work for me at all, as I really enjoy clouds in my photographs, and for grand landscapes they are almost a mandatory feature. It just so happened that as I was planning my weekend, I saw that Saturday was going to have 70% cloud coverage in Roaring Gap, and they were going to be low clouds at that. This usually means some very dramatic skies, which work really well for Stone Mountain. The clouds were not set to build until the afternoon, so I slept in with Toni and set out after she left for work. As I went, the clouds were building, but it was more of a haze than anything. There was very little definition in the clouds. I started to get a little discouraged with my plans and pulled off of the highway and went through Yadkinville in search of a few other potential subjects. 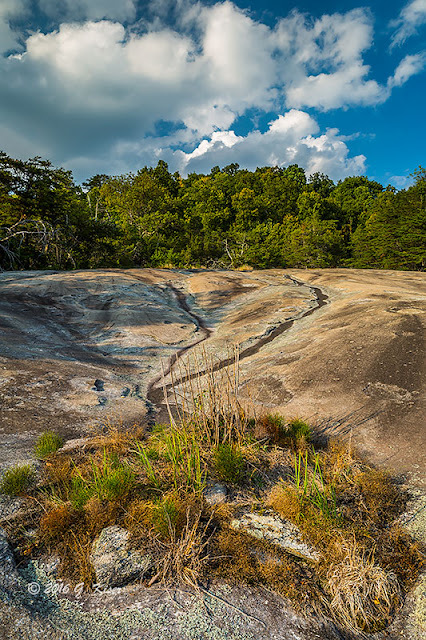 What I found was not presented well in the existing light, so I continued to march on to Stone Mountain State Park. When I got close to the parking lot at the lower trail head, I found cars parked on the sides of the road because the parking lot was filled. Man, I'm just not batting a thousand here! I did manage to find a spot to park in, and I tried to Google what was going on. Of course, I did not have internet connection there, so I was still ignorant to what brought everyone out today. I could see a bunch standing by the map and restrooms, and I could hear kids yelling and screaming already. So much for a relaxing hike to the top of the mountain. I thought about turning around and going home since I don't care for doing pictures when the park is filled to capacity, but since I had driven all this way, and the clouds were looking better, I stuck it out. I took my place in line for the trails and followed a family, with another one on my heels. I had planned on going on the Stone Mountain Loop trail, but when I saw everyone else on that one, and could hear lots of commotion down the trail, I decided to take a detour to the right. I didn't really care where it went because it was quiet. It happened to direct me to Wolf Rock, Cedar Rock, and Blackjack Ridge. I have been to all of these places before, and knew that there were a few things to photograph on that side of the mountain. It was a bit of a hike with the majority of the trail being a steep grade which got me breathing heavy and sweating. I was at least getting my exercise if nothing else! I was fortunate to have chosen this route because I saw absolutely nobody except for a couple coming back down the mountain that said I was the first person they had seen in a couple of hours. GREAT!!!! 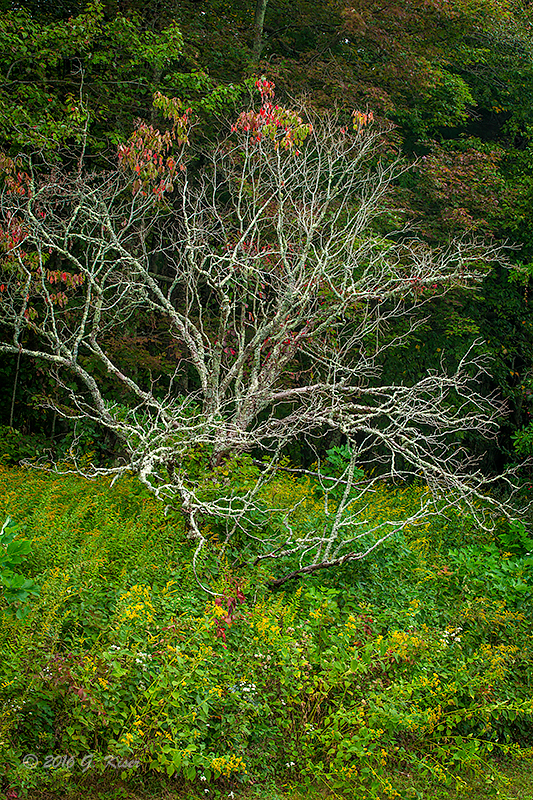 When I got to Wolf Rock, I was still alone, and that gave me great optimism about finding some really good compositions. The problem was, the sky was still rather hazy, and the sun was not in the best position for photography. Most of the good compositions were shooting directly into the sun which would not have worked out very well. What I was left with was a little on the drab side, but on the other hand the trees were already starting to show a little color. The clouds were also better on the side opposite of the sun. The sky was far from being 70% covered though. I pulled out the camera and got it built using my 24-70mm lens for flexibility. It has a decent wide angle coverage and can zoom in fairly tight as well. I screwed on a polarizer to bring out what contrast I could in the sky since there was a lot of haze to deal with. I started to pick out compositions that showcased the yellow leaves and the rolling hills beyond. There was not much to choose from in terms of foreground interest, so I relied on finding interesting patterns in the rocky surface below me. That turned out to be more difficult that it sounds since all of the leading lines I could find went in the wrong direction. I did manage to find a decent patch of interest which provided the foreground for the opening picture for this entry. I stayed around this area for a while before moving on to Cedar Rock to see if there was anything I could do there. 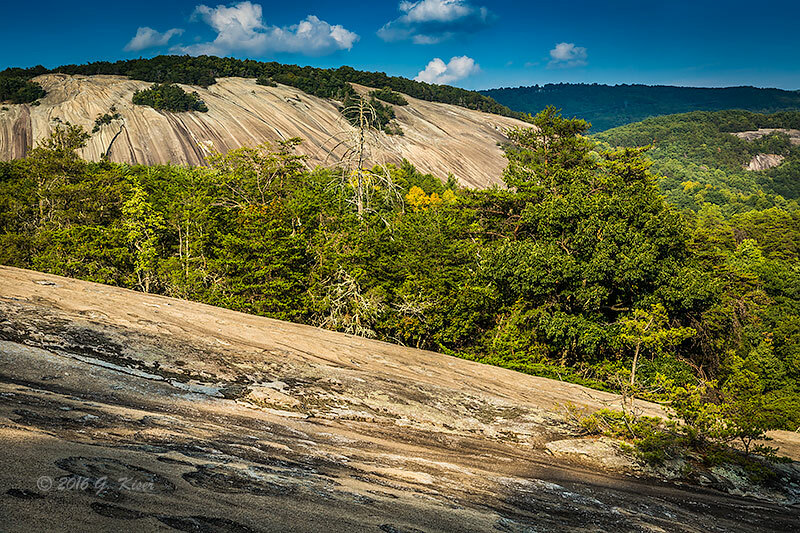 I know that there is one really good composition to be had showcasing Stone Mountain. I was excited to get to it, but that excitement was short lived. Once I got there, I realized that the patch of vegetation that I like to use as a foreground had grown over, and looked rather sloppy. That wouldn't work for me anymore. I wasn't all that upset though because the clouds were thinning out very quickly. Even if the foreground had been there, I would not have been able to capture the picture that I wanted. I started to look around for other compositions and found some eroded drainage lines from the wood line above. I was luck enough for this feature to have a terminal point with a patch of vegetation which would make for a terrific foreground. The background was not all that spectacular, but at least the sky was pretty interesting here. Using my same 24-70mm lens, I got in close and went wide to exaggerate the foreground. This worked out pretty well, and was the first composition I was actually excited about. From there, I continued to look for ways of getting a shot of Stone Mountain. While I was working my way back to the trail, I found my spot. There was a small sapling growing from a crack in the rocks which gave me a little foreground interest, but mainly provided a visual block for the eyes following the slope down and out of the frame. The lighting wasn't too bad here, but the clouds were nearly gone at this point. I was able to capture a few of them just minutes before they cleared the horizon. Once they were gone, it was time for me to move on as well. I tried to follow where the clouds went, out to Blackjack Ridge, but found more expanses of blue sky. It was starting to get late anyway, so I decided that it was time to head on back to the truck. It was around this time, I met another three hikers. I sure can't complain considering how many people were in the park. I continued to search for different subjects and compositions, but could find none that would work with the clear sky, and low sun. All that changed when I got back to the parking lot and found that the cloud coverage I was expecting at 4 was now rolling in at 7. The low sun was even putting on a bit of a show with some color in the clouds. I looked for a picture, but the parking lot made for a terrible element for the sky, and there was not time to hike back up to the top again. I just enjoyed the sight for a moment and loaded the truck up to head home. I had a total of 30 frames exposed on this Trek. Most of them were nothing special, but I found three that deserved a little bit of processing. While not what I was hoping for out of this Trek, I actually found that those three had merit and deserved to be shared. Two of them have found their way into the Landscapes Room even. You might be noticing some changes around the gallery. For years now...TEN years to be exact, I have been known through the name of 446 Photography. That moniker will always hold a special meaning to me, and to Toni. But times change, and it was time to move away from that name. 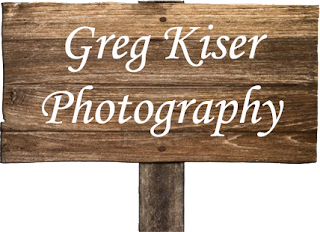 For simplicity, and for a little bit more of a professional approach, I have started using my name, officially relating to my photography. This is a little more than just "hanging a new sign" though. It really symbolizes a shift in my approach to things related to my photography. I really want my photographs to speak for themselves. I figure if my photographs are good enough for me to put my name on the back of each print, I should feel confident enough to put my name at the top of my website. I want you all to get to know me, through my pictures, and through my blog entries about how I created the images. You will also notice a much more streamlined appearance to the gallery. While I liked the old layout, I decided that it was a little bit busy, and lacked focus on the images. I've toned down the textures, as well as the color pallet and have improved the presentation of the images, or so I hope. Please feel free to offer suggestions to the gallery so that I can continue to improve things, and make this a more enjoyable place to spend some time. One other thing that has changed is the addition of another page. I have been very hesitant to list prices because I have not been focusing on selling images for several years now. However, I have been asked a number of time how much I would sell prints for. You can now view that by visiting the "Prices" tab to the right and see the basics. I'm still not in the business of selling my prints, but I am always very happy when folks decide to bring my art into their home or business. I hope you enjoy the new layout, and especially the photographs found within these pages. OK, so I have started working with a new workflow here in the studio. I'm like a kid in a candy store at this point for several different reasons. I've never been much of one for post processing of my images, and have spent countless hours learning how to get the image right in the camera. Part of that is capturing all the available information I can when it comes to exposure latitude. This means I am working with RAW files...or a digital negative. For years, I've been working in various versions of Photoshop to do the basic conversions and tweaking of the images. I've been pretty happy with my results from that workflow, right up until the time of printing. At that point I was not as excited about the product, although I found some work arounds that seemed to work most of the time. After my computer crash a few months ago, I was forced to upgrade my Photoshop since CS4 was no longer available. I ended up with Adobe Creative Cloud, which included the most current version of Photoshop, and also Lightroom. I had mixed feelings about Lightroom, as I had read a lot about it in the past indicating that it was the preferred photo editor these days. I was used to Photoshop though, and don't much like change, so I was reluctant to move into a new editor, especially since Photoshop CC was very familiar in terms of looks and operation to what I was used to. However, I wanted to give Lightroom a try to see what the fuss was all about. The first time I used it, I have to admit, I got so frustrated with it, I gave up and moved over to Photoshop to finish the editing of my batch of pictures. The next time, I tried again, and figured out a little bit more about what the program could do, but got bogged down in the adjustments. I didn't care at all for the final product. This was not due to the program being bad, but rather me making adjustments without knowing what I was doing, and how they worked. 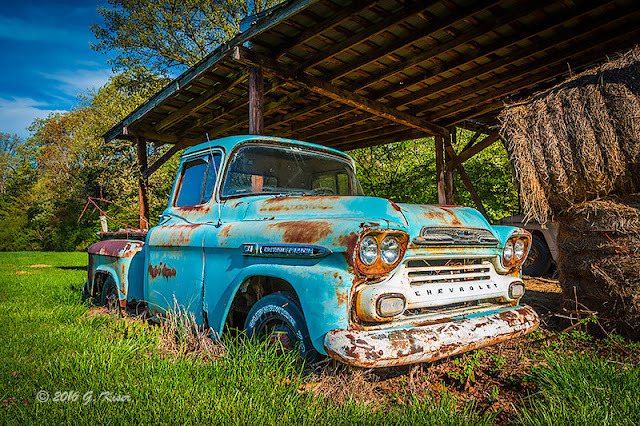 It was time to learn about Lightroom, and quit messing around. I looked into taking a class on workflow, so I could work this part out. After talking to the instructor, I decided that I would be better off watching videos and and teaching myself as I had with everything in photography. Well, I watched a couple of hours of videos on the subject, and learned more than I ever knew about Photoshop. I was ready to roll with the new workflow, and managed to edit a series of photos rather efficiently with Lightroom for the first time, and actually found that I was able to squeeze out all that detail that I had trained myself to capture in the field with the camera. This image turned out very well, but when I printed my proofs as I typically do, I was less than satisfied. There were color casts that I didn't like, and had not seen on the screen while processing them. This was not a new problem; in fact, it was a problem I had been facing since I started photography back in '05. I had done the prescribed monitor calibration, and profiled my workflow, including getting specific drivers for the printer based on the papers I was using. Theoretically, my prints should be exactly what I was seeing on the monitor every time...but it was hit or miss. Even when it was good, it was not quite what I was expecting. This really bothered me with my new workflow because I was actually producing some really nice colors and detail as seen on the computer, only to be let down by the print. I started to do more research (UG graduate here, University of Google) on the topic and found out a step that I had been missing since day one. I was not disabling the computer's printer driver in favor of having Photoshop manage the colors. I learned how to do that, and with a couple of button clicks, and slider movements, I had turned over control to Photoshop. I printed out another proof, and the difference was amazing!!!! This was the image that I was considering, but I wasn't happy with the deep shadows under the roof panels. The colors were good, even though the grill was a little blown out. This just wasn't the right picture for a competition, but I still liked the scene. I happened to be going through my old RAW negatives (which I keep archived) and found a few alternate views of this truck. These had not been processed because I was unable to get them looking the way I wanted through my limited knowledge of Photoshop. However, with my new workflow in place, I decided to give one particular one a try, just to see how powerful Lightroom actually is. As you can see in the last picture, the shadows are very...very deep under the roof. I tried to lighten them a little bit in Photoshop, but any more than this started to look unnatural. This was the limit of what I was able to do with Photoshop. Now, if you look at the opening picture, you can see that the shadows are opened up quite nicely, and even the highlights are much more controlled. The colors are much more vibrant, and actually required no adjustments to the saturation levels to achieve the look. All that this photo represents is a basic conversion from RAW. It took about 5 minutes to process and get ready for print. 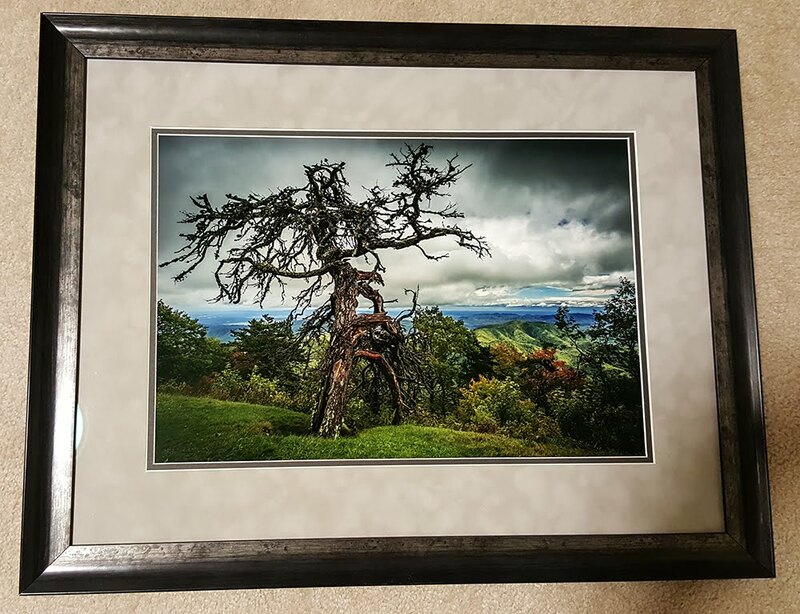 I was so confident about my new print ability that I decided to forego printing a proof and went straight to the big print for framing. When it came out of the printer, I realized that I had finally overcome the one hurdle I have had as a photographer for all of these years. My prints were now spot on what I was seeing on the monitor with no extra manipulations needed. A new chapter is starting, and I'm excited to see what happens next! This Trek was a little different from ones that I've done in the past in a couple of respects. First of all, I was wanting to go out and really try a new workflow with my image processing. Second of all, I wanted to go and have the goal of getting one good picture instead of trying for volume. In a lot of respects, I have succeeded with both of these goals with this Trek. I'm hoping to fine tune what I've learned on this one, and apply it to others, while still tweaking what my intentions are for pictures. Let's look at the first goal. After a recent computer crash, I have been getting used to a new version of Photoshop, which is now referred to as simply "CC" for Creative Cloud. With this program, I am no longer purchasing the software, but subscribing to the service each year. With the subscription comes quite a few other Adobe Programs, most of which I am not planning on using. However, it was the first time I have been able to use Lightroom which is a program I have been hearing a lot of great things about over the years. Since I now had it, I wanted to use it. This was primarily because it was more dedicated to photography, while Photoshop was getting into much more than just photography, and has become rather complex over the years. I have been reading about Lightroom, and watching many videos on the subject trying to get my work flow ironed out. Over the past two or three Treks, I have played around with Lightroom, but ultimately ended up processing in Camera RAW and Photoshop. This is not to say that I am doing a lot of editing in software, because I still feel strongly about capturing the scene as it is, and not manipulating nature. 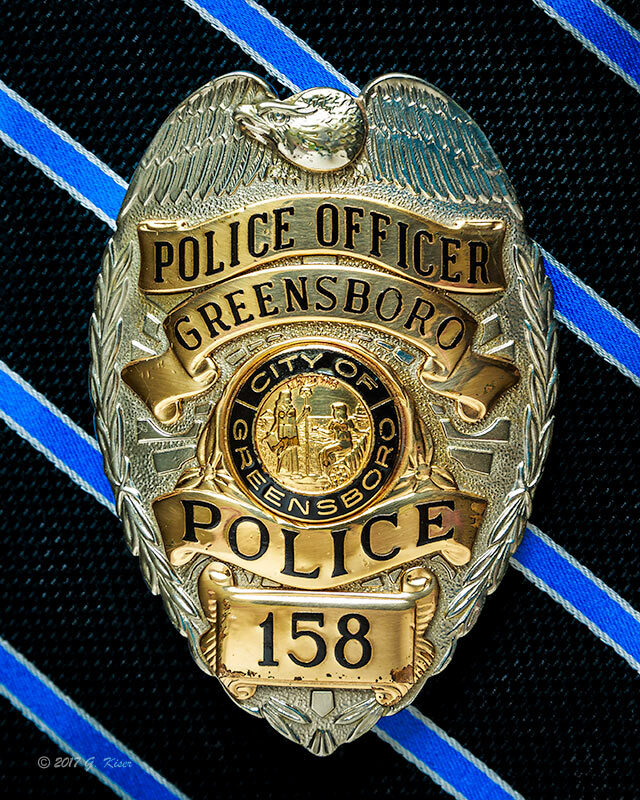 What I am doing is starting from a relatively flat RAW file (digital negative) that has very little contrast and saturation in the interest of capturing as much information in the digital file as possible. 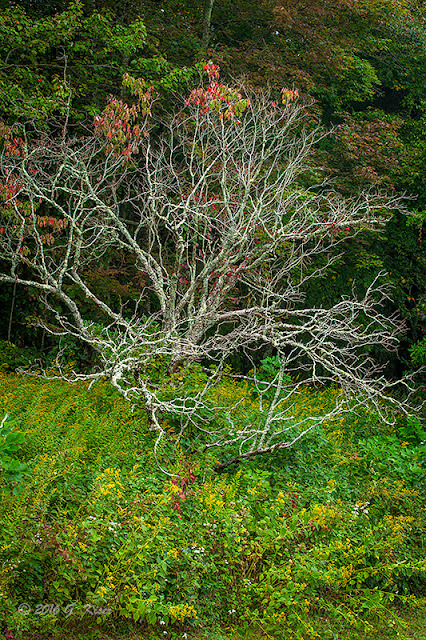 From this, I am processing it to bring out that detail and bring the saturation and contrast back into the final image. There is no slight of hand in what I am doing, and even when I am doing a lot of tweaking of the image, I am still nowhere near the "photo manipulation" end of the spectrum....but I digress. This Trek marks the first time I have been able to come back, and actually import the RAW files into Lightroom, and start to work on them from that program. It took a little trial and error in some of the windows, but I actually made a final image that I was happy with on a first try. I then imported it into Photoshop for just a little bit of polishing because I was used to how that worked with my printer. I also made a B&W conversion of the above picture that I really liked from this shoot. 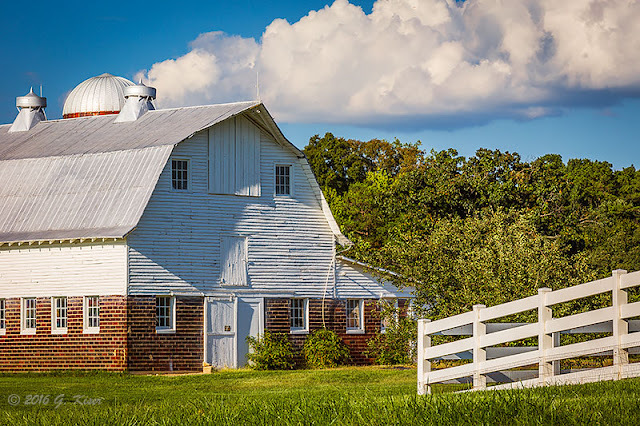 Of course, the subject here is a barn that I have visited many times in the past. I have shot it under stormy skies, blue skies, and even in the dead of night under starry skies. Each time, I have captured a different feeling with the images. This time, I wanted something a little different. I have been wanting to get this barn with the white fence of the neighboring yard for some time. My previous attempts have been rather blah because of my compositions. Either I have been too far away and the fence was a bigger element than I wanted, or I had come in close, with a wide angle lens which has had the same result. In my attempts to stay away from a "normal" view, which is what I usually end up with when I shoot with my 24-70mm, I decided to use my 70-200mm for some scaling properties. 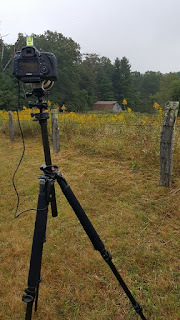 With this lens, I would be able to keep the visual scale similar between the barn and the fence, and I had decided that I was only going to include a small portion of the fence to keep the balance in place. 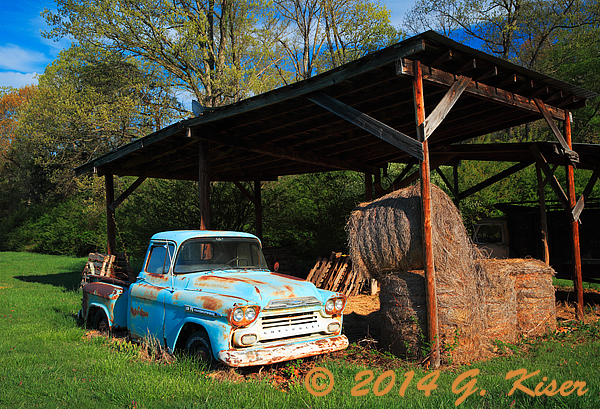 It took a bit of time to set up a good point of view where the fence made sense, and the barn was still dominant. This was part of my second goal. I was no longer worried about making as many good pictures as I could. I wanted to capture just one image that represented what I was thinking at the time. I think that the images above (still only one image) captures that very well. The clouds work nicely to keep the sky visually interesting, and the fence works with the barn instead of against it as it has in the past. 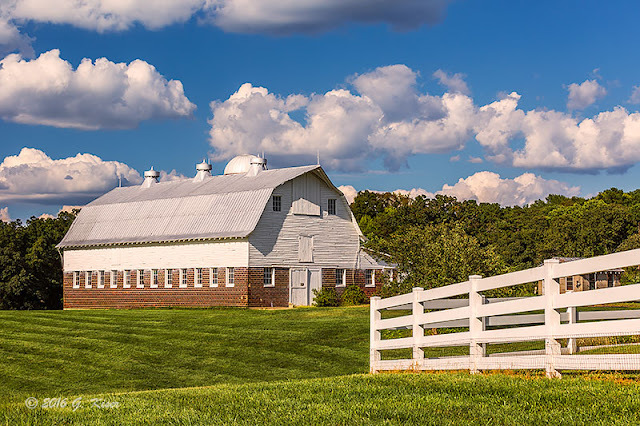 The rolling grassy field keeps the foreground interesting and feeds into the fence, helping it to make sense, and not look like an added in element. As I was trying to perfect the composition, I shot from far away all the way up to a point where my 70mm focal length would not capture the entire barn. This actually turned into an interesting view where I cropped out the long side of the barn, for a more intimate view. It is this view that Toni enjoyed the most, and I also like how it presents. As you can see, the clouds are less of an element in this image because there is so little sky above included in the frame. I was lucky that there was a cloud formation directly above so that the sky wasn't rendered as a stark blue void. While I like this composition, I think I am still partial to the openness of the other composition. Either way, I have finally done a full photo shoot, start to finish with a new workflow in place. It took a little bit longer, but I can see some promise to using Lightroom, and plan on tweaking this workflow over the coming Treks.